Evergreen Media Group has acquired the rights to Courageous Cat and Minute Mouse, a cartoon series from the 1960s. 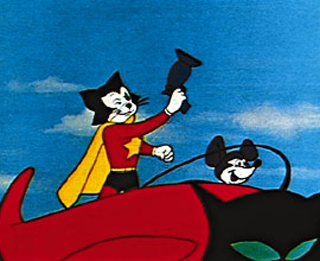 Courageous Cat, created by comic book artist Bob Kane, was a parody of Kane's better-known creation: Batman. Courageous Cat and his sidekick were a crime-fighting duo who lived in the Cat Cave, and, when summoned by the Cat Signal, would race to the scene of the crime in their red Cat Mobile. Courageous Cat would then fight the bad guys with his all-purpose Cat Gun. As with the recently announced Paddington Bear film, Evergreen will be rebooting the Courageous Cat franchise with a blend of live-action and CGI. I think you mean, "Kane and colleague Bill Finger's better-known creation: Batman."